1) Avoid deforestation and close the forest frontier. The first-order priority is to end deforestation by closing the “forest frontier,” or intact forests, to development. If the world fails to protect its remaining tropical forests, keeping global temperature rise to 1.5 or 2 degrees C (2.7-3.6 degrees F) – the level the international community has agreed is necessary to prevent the worst climate impacts – becomes almost impossible. Increased support for protected areas, indigenous peoples’ rights and better land use planning and enforcement are fundamental steps. Securing indigenous rights to land tenure makes strong economic (as well as moral) sense. Further progress on the deforestation-free supply chain movement is also urgently needed, both in terms of scaling up implementation by companies that have already made commitments, as well as in bringing new companies and markets on board. There are significant gains to be made in increasing agricultural productivity and ensuring greater uptake of climate-smart agriculture. Across the world, farming practices can be made much more efficient and resilient by providing training services for farmers, strengthening smallholder cooperatives and investing in state-of-the art farming techniques. The closure of the forest frontier provides farmers with the incentive to intensify their production on existing land. Reforming global agricultural subsidies, currently worth $519 billion per year, could also lead to vastly better outcomes from the farming system. For example, incentives for cattle expansion in the Amazon could instead be reformed to support investment in forest restoration or raising livestock in harmony with forests and other ecosystems. 3) Restore forests and landscapes. There is a major economic prize to be won in restoring degraded forests and agricultural land. By allowing degraded forests to recover to natural forest, supporting agroforestry and other strategies, restoration could lead to economic gains of $35–40 billion per year within 15 years, as well as a myriad of social and environmental benefits. There are a number of measures to spur public and private sector investment in restoration, including incentives from national governments and multilateral development banks providing “first-loss guarantees” to investors committed to restoration. 4) Reduce food loss and waste. One-third of all food produced is lost or wasted along the food chain, costing the global economy an estimated $940 billion annually and producing about 8 percent of global emissions. If food loss and waste were a country, it would rank as the world’s third-largest emitter after China and the United States. 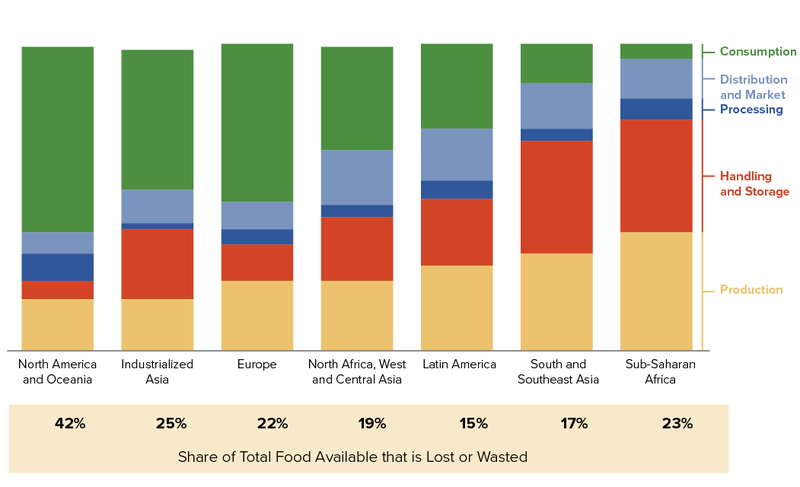 Saving just one-quarter of the food currently lost or wasted would be equivalent to the amount of food needed to feed 870 million people annually. It also makes good business sense: Recent research found that companies investing in food loss and waste reduction saw a median benefit-cost ratio of 14:1. Coalitions such as Champion 12.3, which brings together executives from business, government and organizations, have a critical role to play here. A comprehensive global effort to address the double burden of malnutrition and obesity will be critical to securing better and more inclusive growth in the 21st century. Across the world, almost a billion people suffer from inadequate diets and insecure food supplies. At the same time, current trends towards diets high in processed foods, refined sugars, fats, oils and red meat have resulted in more than 2.1 billion people becoming overweight or obese. This increase in collective body mass is strongly associated with the increased incidence worldwide of chronic non-communicable diseases, especially type II diabetes, coronary heart disease and some cancers. If current trends continue, these chronic diseases are predicted to account for two-thirds of the global burden of disease. The global economic cost of obesity alone was estimated to be around $2 trillion in 2012, roughly equivalent to the global cost of armed conflict or smoking. Public policy and private sector action can deliver major changes here, whether through the use of economic instruments such as a “sugar tax,” the issuance of public health guidelines such as the Chinese government’s advice on reduced meat consumption, or through innovative private-sector approaches such as The Cool Food Pledge, the Better Buying Lab or blending mushrooms into burgers. Action across these five areas would lead to better and more resilient economic growth. It would also make it more likely that the world will meet the Sustainable Development Goals and the Paris Agreement on climate change. Despite much progress, there is still a great deal to be done—and a massive prize to be won.